You are here: Home / About Hanukkah / What is Hanukkah? What is Hanukkah? This will be a popular question in the coming weeks with the 2011 celebration just 6 weeks away. 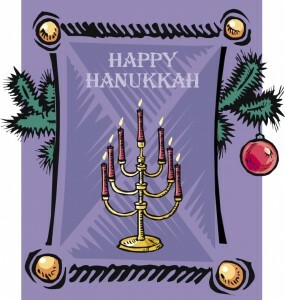 Hanukkah is a Jewish holiday where they celebrate the victory over the Greek. The festivities are celebrated for eight straight days. This year Hanukkah starts on December 20th at sundown. At this time millions of families across the globe will light up their Menorah. A Menorah is a collection of candles, and sit along a metal arc. Sort of like a candelabra. Each night for the eight days one candle is lit. During the lighting of each candle the Jewish people say prayers, and sing songs and count their blessings. Once completed exceptional food, gifts and a variety of games are held. Jewish children are often confused as to why they celebrate for an eight day period while some of their friends and classmates celebrate Christmas. This generally raises the question of what is Hanukkah, and why is it different than Christmas. In actuality, they are not all that different. Both holidays are a celebration where family and friends get together and have a good time. Large meals, presents, and fun times are typically organized for both events. So, while those celebration Christmas will be eating turkey and stuffing, Jewish people that are celebrating Hanukkah will be eating latkes, cheese gilt, sufganiyot and levivot. When celebrating this great festive time, it is important to reflect on what is Hanukkah. Simply put it is dedication as this is the meaning of the word. During the Rebellion the Maccabees who were Jewish soldiers fought the Greek for the Holy Temple. They were called the Maccabees as this was translated to English as Men who are as stong as hammers. Once they were able to take the Temple back, they would run short on oil. One container was available, and only enough for one night. History states that there was a miracle, as the oil they had on hand last them for eight nights. Thus the reasoning for eight nights of celebration. Hopefully this little article provided you with a small history lesson and has taught you a bit about what is Hanukkah.